The powerful deepEX® PowerBrush brush removes difficult stains from almost every type of industrial floor. 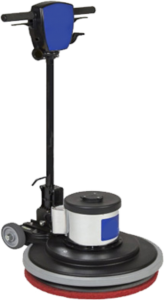 The ALLROUND version is soft and highly recommended for cleaning Epoxy floors. Once clean, they shine as new and are free of stains. It is very important to protect recently cleaned mineral surfaces. 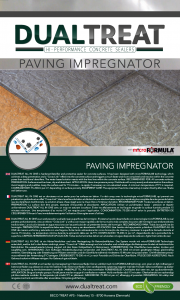 We recommend to use our excellent DUALTREAT® PAVING IMPREGNATOR. It is very profitable and you will get the maximum value for your customers' money. Our detailed cleaning instructions can be found in our cleaning guide. 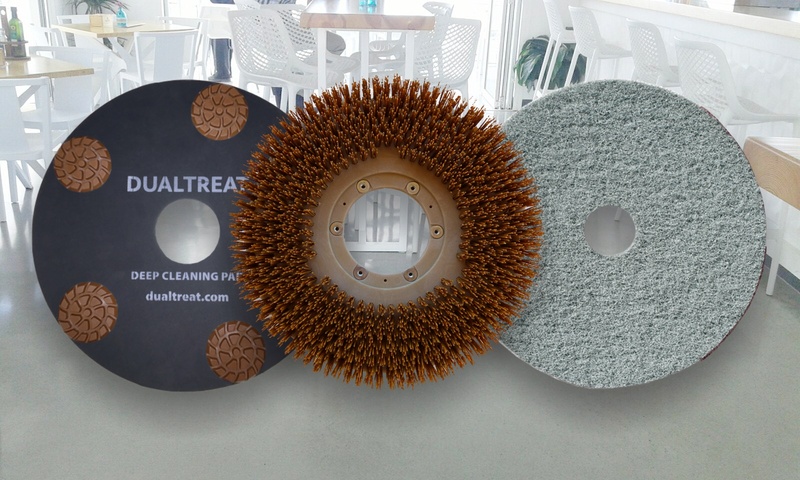 If dust proofing and sealing is necessary, the DUALTREAT® DeepCleaningPad will previously eliminate with a single application the micro-roughness and stains from the surface. Subsequently the floor is dust proofed and sealed to drastically reduce the absorption of water, oil, grease and dirt particles. 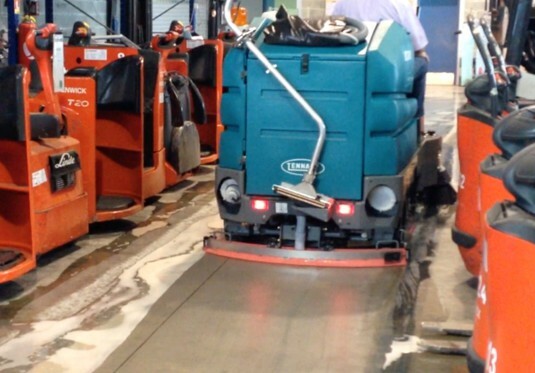 The renovation of a concrete floor with DUALTREAT® creates an easy-to-clean surface. In addition, it improves its aesthetics considerably. 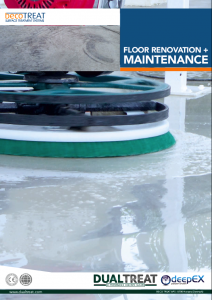 For more information about our dust proofing and surface sealing treatment, see our brochure or give us a call. After the deep cleaning, dust proofing and sealing of the surface, daily cleaning with deepEX® DiamondPad is a very simple issue. You can significantly reduce the maintenance costs of your industrial floor and keep it in a perfect shape for many years. 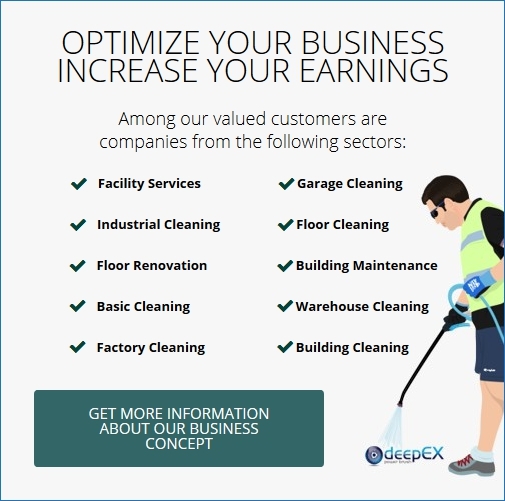 Industrial Cleaning + Maintenance guide for our partners. Very dirty concrete floors require a more intense cleaning. 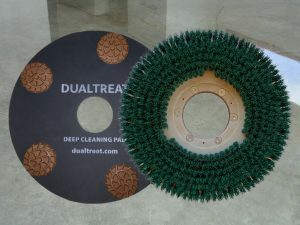 DUALTREAT® DeepCleaningPad removes very difficult and deep stains. It is available in grit 100, 220 and 400 and serveral sizes. 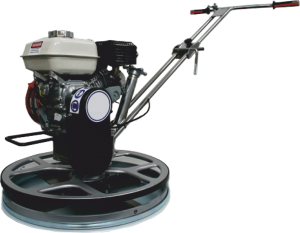 They are compatible with any single trowels, floor buffers and scrubberdryers. During the cleaning process, the DUALTREAT® DeepCleaningPad removes the micro-roughness by grinding the top layer of a concrete floor. This is where stains usually adhere, and therefore they will disappear. Once cleaned, we recommend a dust proofing and sealing of the surface with the appropriate DUALTREAT® system. 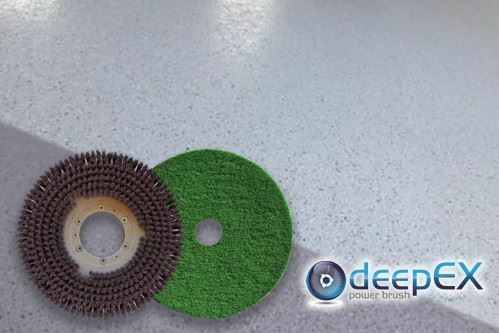 The powerful deepEX® PowerBrush brush is made up of industrial diamond bristles. It is available in various sizes and 4 different grits. Mount your deepEX® PowerBrush on any single trowel, floor buffer or scrubberdryer and remove easily difficult stains. Clean garages, walkways or warehouses with the deepEX® PowerBrush. And the best: ONLY WATER IS NEEDED! Mineral surfaces cleaned with deepEX® PowerBrush should be protected with DUALTREAT® PAVING IMPREGNATOR or with a suitable DUALTREAT® system. Independently if it is concrete, terracotta, pavingt, stones, our impregnations offer a sustainable protection. 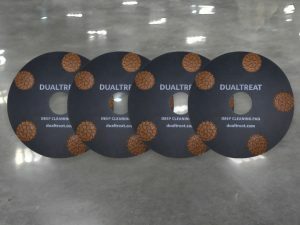 deepEx® DiamondPads are daily cleaning pads. They are have a diamond impregnated surface and are available in sizes from 13-24 inches. 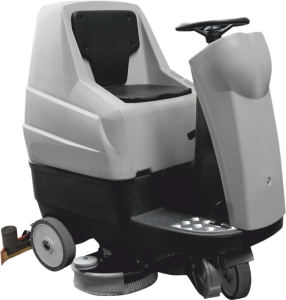 They can be mounted on any trowel machine, floor buffer or scrubberdryer. Due to its diversity of grits, deepEx® DiamondPad contributes significantly to a clean and aesthetic floor. Thanks to the properties of mechanical cleaning, dirt is easily removed and the surface gloss is easy to maintain. 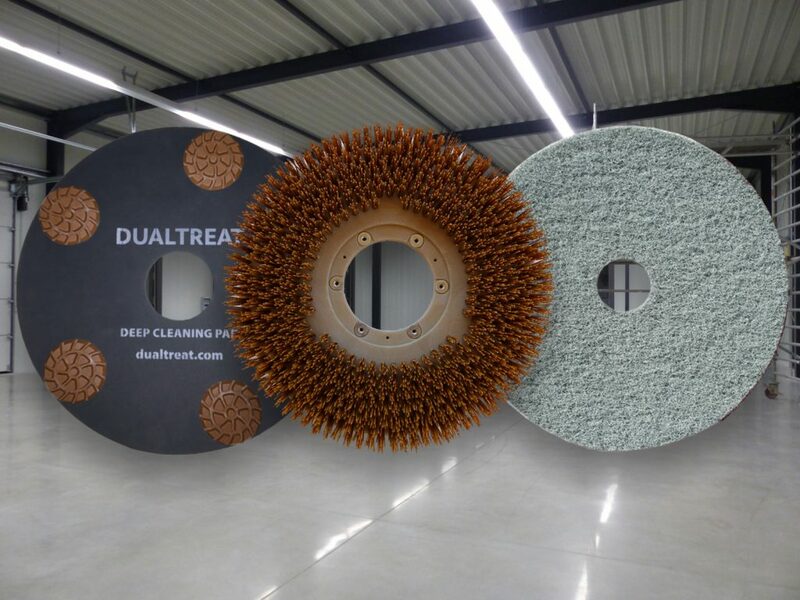 In addition, the DUALTREAT® cleaning program is able to regain a floor's lost shine. deepEX® DiamondPad is especially recommended for Epoxy floors. The best results are achieved with a pH-neutral soap or equivalent cleaning products. For polished concrete floors we recommend an annual treatment with DUALTREAT® REFRESH. The surface will maintain its shine like the first day. In addition, the sealing protection in areas with high traffic of people and vehicles will be completely restored. For more information, see our cleaning guide or contact us now.